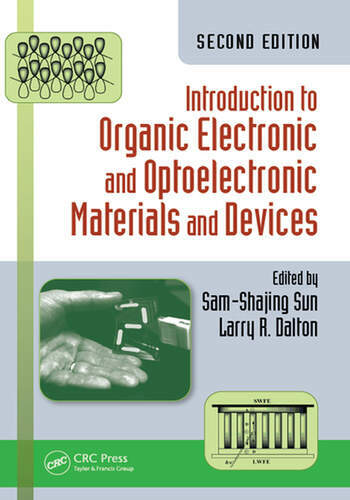 This book covers the combined subjects of organic electronic and optoelectronic materials/devices. It is designed for classroom instruction at the senior college level. Highlighting emerging organic and polymeric optoelectronic materials and devices, it presents the fundamentals, principle mechanisms, representative examples, and key data. "The main research and application areas in opto-organic materials are well presented in this book." "… a very comprehensive and informative handbook. This new edition covers a wide range of topics that describes basic principles of operation, fabrication, properties and performance of electronic devices. There are many new and important chapters such as chapters 20, 21, 30-33 and others that reflect research directions in the area of organic electronics. In my opinion, this book will be a good resource for researchers in the field of electronic devices based on organic molecules, faculty members who teach related courses and also students who are making their first steps in this exiting field." "…an excellent resource for both experts and beginners who want to develop and expand their background in this field." "This book is an excellent resource for graduate students… [it] contains an excellent balance of chemistry, device physics, and applications." "This is a resource book that spans in coverage breadth and extends in topic depth. It speaks fluently to all levels of learners with limited degree of translation, thereby ensuring independent study while traversing in the current topics that drive research." "The book offers a complete and accurate overview of organic electronics, starting from the fundamental theory to the most common and well-established applications. The book can be extremely useful for a student because it contains not only the most common topics selected in a typical course, but also an accurate overview of "exotic" but widely known fields of organic electronics, such as spintronic and computational approach, that are not completely or entirely discussed in a course." "…covers a very broad range of topics in organic electronic materials and devices… the second edition of the book has four more chapters with additional four different topics which were not covered in the first edition, and this means the main strength of this book is further enhanced with these additions." "This book is one of the most complete regarding the applications of organic materials in electronics and optoelectronics. The second edition of this monumental book has more than 1,000 pages that span 33 chapters. The book is clearly written and beautifully illustrated. The book is a must for anyone working in the area of electronics and optoelectronics based on organic materials."